I'm a guy, and I seldom play games as anything but a guy. I play Mass Effect as a female character, though, for some reason. Very few of my fellow Mass Effect gamers do. Fewer than one of five. What to make of this? It's hard to say without knowing the percentage of Mass Effect players who are male and the percentage of gamers who usually gender-bend and play against their real gender. 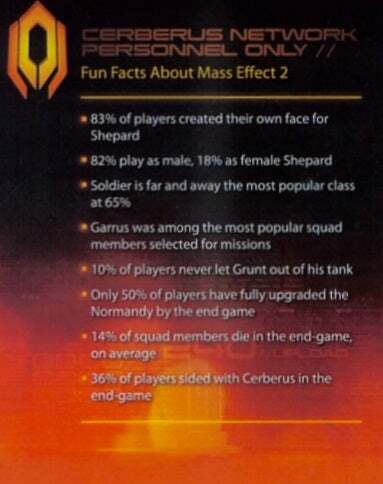 We can, however combine that official stat with others in this information card sent to Kotaku by the Mass Effect creators at BioWare and see that almost two-thirds of Mass Effect players play as soldiers. That's the character class that specializes in guns, not stealth, not special sci-fi powers... just shootin'. A lot of you are also fans of Garrus. Do we have nothing in common?